Since moral subjectivism is very popular today, the following version of, or twist to, the moral argument should be effective since it does not presuppose moral objectivism. Modern people often say they believe that there are no universally binding moral obligations, that we must all follow our own private conscience. But that very admission is enough of a premise to prove the existence of God. Isn't it remarkable that no one, even the most consistent subjectivist, believes that it is ever good for anyone to deliberately and knowingly disobey his or her own conscience? Even if different people's consciences tell them to do or avoid totally different things, there remains one moral absolute  for everyone: never disobey your own conscience. Now where did conscience get such an absolute authority-an authority admitted even by the moral subjectivist and relativist? There are only four possibilities: (1) from something less than me (nature); (2) from me (individual); (3) from others equal to me (society); or (4) from something above me (God). Let's consider each of these possibilities in order. 1. How can I be absolutely obligated by something less than me- for example, by animal instinct or practical need for material survival? 2. How can I obligate myself absolutely? Am I absolute? Do I have the right to demand absolute obedience from anyone, even myself? And if I am the one who locked myself in this prison of obligation, I can also let myself out, thus destroying the absoluteness of the obligation which we admitted as our premise. 3. How can society obligate me? What right do equals have to impose their values on me? Does quantity make quality? Do a million human beings make a relative into an absolute? Is "society" God? 4. The only source of absolute moral obligation left is something superior to me. This binds my will morally, with rightful demands from complete obedience. What do you think of the argument? 1. The word "absolute" as it is used here is appropriate because the author's contend that "...that no one, even the most consistent subjectivist, believes that it is ever good for anyone to deliberately and knowingly disobey his or her own conscience..." This is different from the argument and context I blogged about last week here. 2. 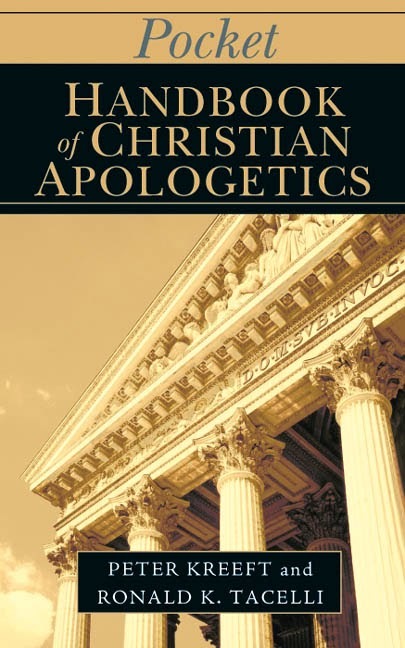 Peter Kreeft and Ronald K. Tacelli, Pocket Handbook of Christian Apologetics, p. 24-26. A thought extension of the moral argument. Still, I would wonder about the erring conscience, e. g. the one that values free love that fails to understand the heartache of the jilted (other examples endless). like all arguments that appeal to reason, it travels quite far in the direction of the city of God, then in the distance the road starts to look a bit hazy and you can't quite make out its ultimate destination. God likes leaving hints.